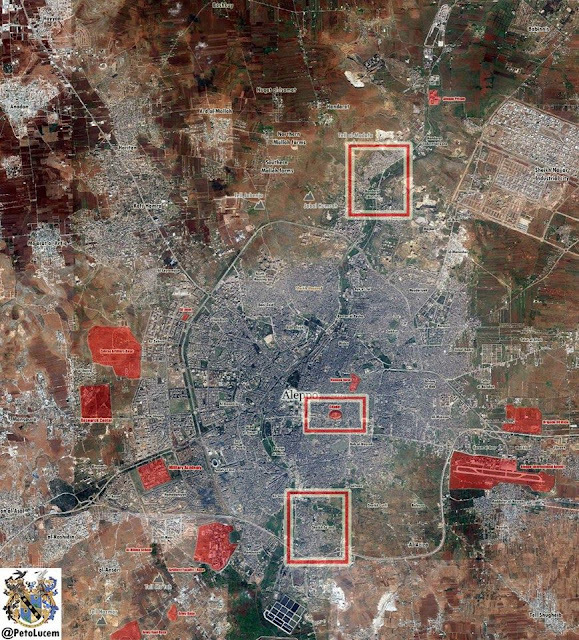 September 24th – Aleppo, Syria – Pre-dawn around 4 am, the Syrian Arab Army and allied forces launched the largest phase of an all out offensive in Aleppo, which was declared on September 22nd. At the time of publication, this is an ongoing offensive in the form of a three pronged attack. The map below shows us the starting points of the three pronged attack – in boxes. Today’s major attack began from three directions indicated above. It is the culmination of the last 48 hours of fighting in the aftermath of the failed ceasefire. 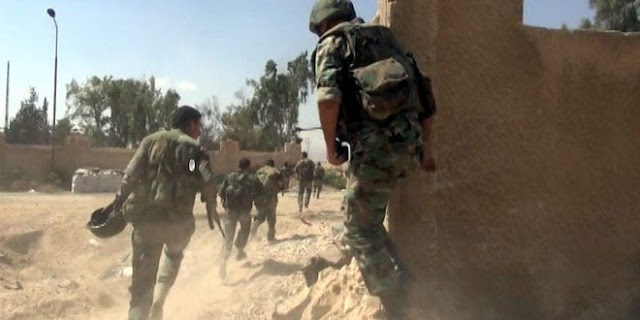 It is reported that the Syrian Arab Army had observed the movement of jihadist reserves in the encirclement, and these positions were the result of tactical victories in the last two days. We will give some background in the following section on how the pieces came to be positioned in this way. This phase of the offensive was delayed by up to 20 hours for reasons explained in the below section of this report ‘The Last 48 Hours’. Between 45k to 70k Syrian soldiers and their allies are reportedly involved around Aleppo and 20k to 25k terrorists are inside the city. We are unable at this time to narrow the numbers down more precisely.These moves are all just the beginning of a series of coordinated attacks which, we are cautious to say, may determine the outcome of this conflict. Significant is that Lavrov has taken the future possibility of unilateral ceasefires off the table. These were unilateral as it was revealed in public statements and some leaked elements of the ceasefire agreement, because Al-Nusra, not a party to the ceasefire, was included in the areas under protection of the ceasefire based on the US’s claim that they were trying to ‘separate’ the moderates from Al-Nusra. Lay critics and citizen-activists not familiar with what was important for Russia and Syria for the ceasefires, had pointed at that the cessation of hostilities came at the same time in reports published, including our own, that victory was in sight. It is clear now that the Russians used the ceasefire talks and the documents produced as a result, to prove to the international community, and for posterity, that the US could not distinguish between, or separate out, ‘moderate rebels’ from the Al-Nusra terrorist group. What we may find is the US directly assisting the terrorist units, which it admits are inseparable or indistinguishable from the apparently fictional ‘moderate rebels’, dropping supplies by air, which will raise the question of the extent to which Syria and Russia will respond. Focusing now back on the logistics of this offensive, we will first examine the southern offensive. The Syrian Arab Army (SAA), backed by Hezbollah and Liwaa Al-Quds (Palestinian paramilitary), launched a new assault at the 1070 Al-Hamdaniyah Housing Project in southern Aleppo on Saturday, striking the southern sector of this district that is controlled by Jaysh Al-Fateh (Army of Conquest).Led by the Republican Guard and 4th Mechanized Division, the Syrian Arab Army and their allies stormed the southern sector of the 1070 Housing Project and the nearby Hikmah Hill, resulting in a fierce battle that is still ongoing.According to a military source in Aleppo city, the Syrian Armed Forces and their allies are attempting to break-through Jaysh Al-Fateh’s final line of defense at the 1070 Housing Project, while a large Hezbollah unit attacks the Qarassi axis. These moves will be possible based upon positions already held and reinforced from around September 10th or 11th, and this mornings gains. Two groups, one to the south-east and the other to the south-west of the Sheikh Saeed district, will push towards the center, joining in that district, routing terrorist groups before they can manage to reform their line in the aftermath of the aerial bombardment previously. This will likely be a combined assault by the SAA, Liwaa Al-Quds, with Hezbollah, and will involve the celebrated Tiger Forces. Now let us turn to the eastern offensive. We know that the 106th Brigade of the Republican Guard, part of an elite mechanized division making up 25,000 fighting men, is on the eastern part waiting to storm, and it is possible the forward movement of their offensive has already begun at the time of publication. The SAA began today’s eastern-most activity by stretching the reserves of jihadist in the circle very thin with artillery barrages, using the tactic of attrition before the vanguard storm. Again, we are expecting this attack of the Syrian Arab Army from eastern direction, or, this has already begun. The 102nd and 106th Brigade of Republican Guard are confirmed as involved in the attack which may, at the time of publishing be underway. Now looking at the northern offensive, we refer to the uppermost box at the north of the map, where that group launched their assault in the area shown in Figure 1. In this northern-most prong, the Handarat refugee camp was liberated by SAA forces backed by the Palestinian brigade, Liwaa Al-Quds. The entrance was liberated sometime afternoon, with conflicting reports. But after 4:00 pm today, total control was finally confirmed by spokesmen from Liwaa Al-Quds. This was reported by SANA and AMN. This includes strategically important hilltops, necessary for the assault to progress in a southerly direction. This area northernmost in Figure 1, above, is shown at the top in the following, Figure 3. Figure 3, however, represents the latter development of the northern offensive. In this, the group that took the Hamdarat refugee camp, they then shifted their attention to the “Shuqeif Industrial Area that is located right next to the Bureijj Quarries of northern Aleppo”, according to AMN.The Syrian Armed Forces and their allies were able to assert fire control over the Shuqeif Industrial Area after seizing the hilltops overlooking this part of northern AleppoThe last 48 hours leading up to today’s phase of the Aleppo offensive:Following the end of the ceasefire, Russian and Syrian air forces began to strike terrorist held areas. Kerry protested this in a public media spectacle, manipulating the public misconception that there was still a ceasefire in effect. The SAA unilaterally ended the ceasefire about half a day after its positions were intentionally hit by US forces acting in conjunction with ISIS. Kerry’s protests came the following day. These air strikes were very effective, and created the possibility for the following tactical victories. 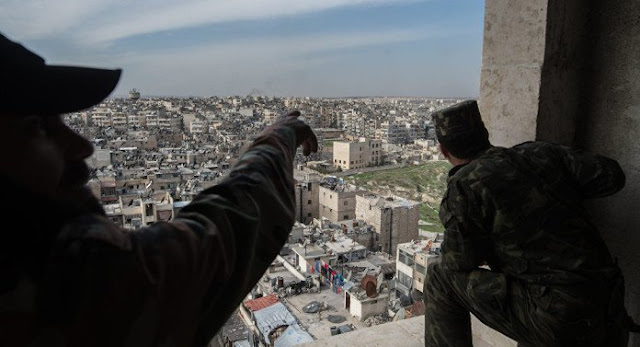 The regional military command in Aleppo announced the beginning of military operations in the Eastern neighborhoods of Aleppo. The regional military operations’ command call on the fellow civilian citizens to keep away from the known buildings in which the terrorists use as hideouts and command centers. The regional military command in Aleppo: There will be no legal liability, arresting or detention to any citizen who make it to an of the Syrian Arab Army’ checkpoints around the Eastern Neighborhood. We took all measures to welcome the civilians out of the Eastern Neighborhood, provide temporary residence and provide life aid for a dignified living. The offer also include all gunmen who were deceived into holding arms against their Armed Forces, and want to surrender their arms to get back to their civil life. Translated from the website of the Ministry of Defense of the Syrian Arab Republic وزارة الدفاع في الجمهورية العربية السورية website. 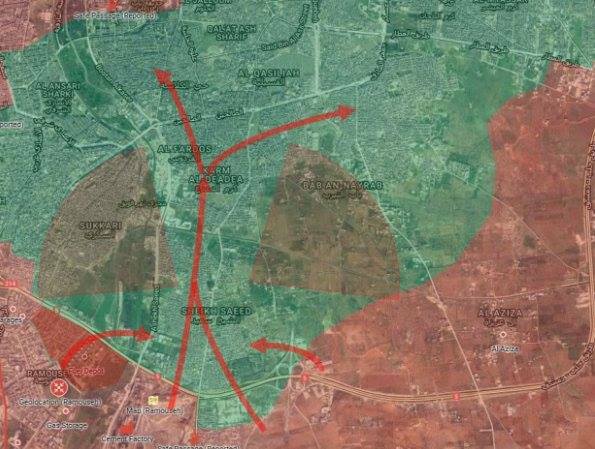 Yesterday, September 23rd, as Al Masdar reported, “less than 24 hours after the announcement of the Aleppo offensive aimed at capturing the rebel-held districts of east Aleppo, government forces were able to secure the Ramousah-‘Amiriyah highway and its intersection following consistent advances around Al-Badawi mosque in ‘Amiriyah. Preceding this advance were 8 intense hours of violent clashes on the Ramousah Bakery axis. This sensitive advance places the Syrian Army forces on the outskirts of Sukkari district, the militants’ administrative hub in the embattled city. Moreover, government troops now have fire control over the jihadist forces in the aforementioned areas. Notably, opposition forces suggested that Jabhat Fath Al-Sham (formerly Jabhat Al-Nusra) is relocating many of its fighters from all jihadist-held Aleppo and massing them at Sukkari where they have imposed a curfew. Meanwhile, Syrian helicopters dropped thousands of leaflets atop east Aleppo neighborhoods calling on militants to turn themselves in before it becomes too late. 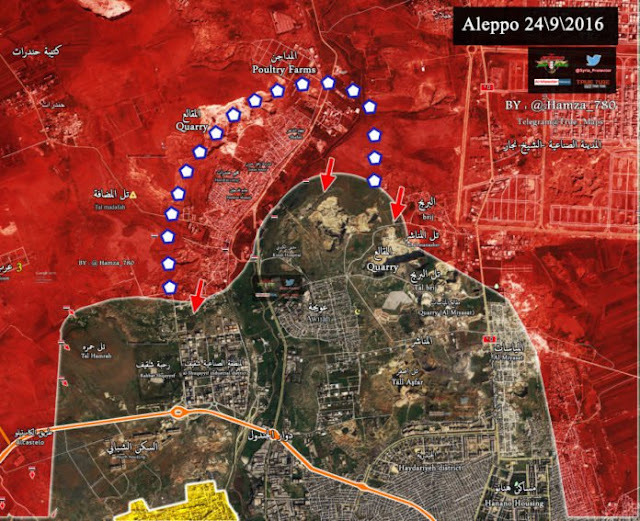 The Syrian Army and its allies are expected to capture and fortify Sadkop at any time. Securing this region will enable its use as a launchpad for operations on Sukkari and Sheikh Sa’eed. SyAAF and RuAF are conducting airstrikes against enemy targets in the Eastern neighborhoods of Aleppo. All the data about the targets were collected by Syrian Military Intelligence operatives inside enemy controlled territories and only high precision munition are being used to avoid/minimize unneeded damage.These airstrikes come hours after the regional military command in Aleppo announced the beginning of a military operation in the Eastern Neighborhoods.We told you constantly on this page that the terrorists who took the people of the Eastern neighborhoods as human shields and kept them hostages while shelled the Western neighborhoods terrorizing and killing civilians will be made an example of. The land operation haven’t started yet but its imminent; and their Sultan nor their masters will be able to save them then. On Wednesday there was a meeting inside the Syrian regional command HQ in Aleppo and Major General Zaid al-Saleh the regional commander in Aleppo announced that the armed groups in the Eastern Neighborhoods will have until the end of September to drop their weapons and the Syrian nationals among them will have full amnesty. Last night the Syrian regional command officially announced the beginning of its operation in Eastern Aleppo but also announced that all citizens who make it to an Syrian military checkpoint will not be legally liable, will not be detained and will not be arrested; they will be transported safely to a temporary housing where they will be provided medical care, and aid for a dignified living until their neighborhood is liberated and they can go back. 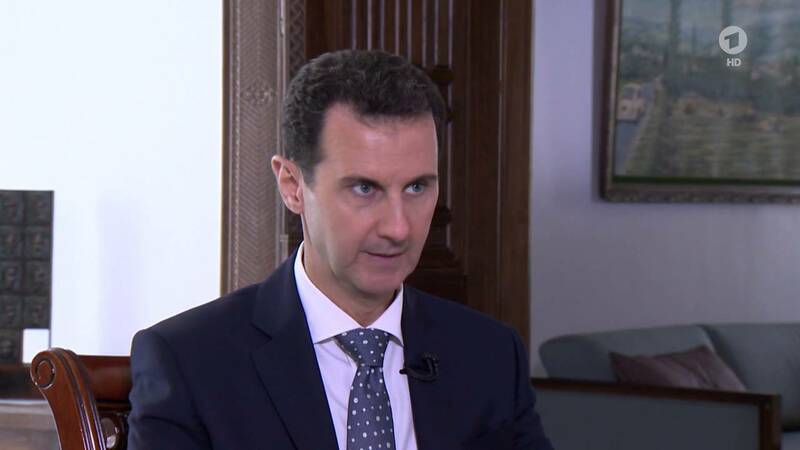 That offer was extended to all Syrian nationals who were deceived into holding arms against their armed forces. But that does not mean there will not be a military operation or military operations are ceased, we will keep the battle and tactical details undisclosed for the time being but we simply, and with all information that we can share, are explaining the situation in Aleppo and why things are going the way they are. For those who read between the lines this post is perhaps enough, and for those who need more direct statements, you will get it when the battlefield talk[s]. In other parts of Syria, presently the 104th Brigade is in Deir Zor, and the 103rd is in north Latakia, with the 105th in East Ghouta.In Aleppo, we expect an attack from the east and are waiting. Practically, the main part of this conflict, barring increased foreign interference, is at an end because about 25% of the best trained terrorist forces in Syria are in the Aleppo encirclement, and this is one of the last good combat zones for difficult-to-take urban areas in their fight.